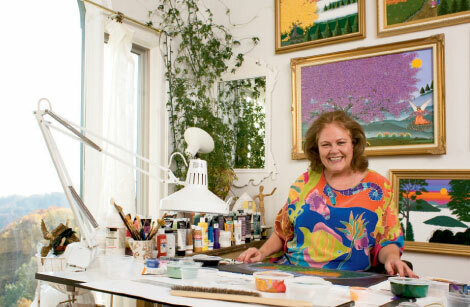 Caribbean Queen: When it comes to art, culture, and now cuisine, Rita Genet relies on Jamaica as her muse. Clad in a flowing silk batik dress, artist Rita Genet swings open the front door of Rose Hall, her palatial Neo-Georgian manor on Town Mountain in Asheville, to welcome a smiling face. Personal chef Darlton “Fuzzy” Kenton is here to guide her through the finer points of preparing a Jamaican meal. The hostess grew up in New England and New York City, but quickly developed a taste for the Caribbean lifestyle after her first trip to Jamaica in 1972. She returned two years later and began to paint vibrant depictions of the island’s fields, flora, and slice-of-life scenes. Eventually she was offered an exhibition on the island by the tourism board, which was followed by more offers to show her work and the impetus for return visits several times a year. In her New York, she hosted “apartment art” exhibitions, selling her works to friends and new collectors. She settled in Jamaica in 1987 and stayed for 15 years. Making the arrangements for today’s luncheon of Caribbean fare was second nature. During her time on the island, she hosted lavish soirées—dinners for 50, where the men dressed in tuxedos and ladies in gowns and jewels. Cooking, on the other hand, was left to chefs while the lady of the house concentrated on entertaining. “My Jamaican friends can’t believe I’m cooking today,” Genet says with a laugh. Thankfully, Kenton, a native of Jamaica who enjoys hometown celebrity status after authoring two cookbooks, is happy to lend his expertise and time. And Genet is grateful for the chance to deepen her culinary understanding of the country she once called home, and share a taste of it with her friends in the mountains. The ackee and saltfish appetizers, which Kenton prepared in advance, are certainly an authentic flavor. Salted cod blended with ackee—a slick-textured fruit from a tree introduced to the West Indies via Africa—is considered the national dish, and Kenton’s version is served cupped by fried plantain slices. Ackee is a curiosity to the uninitiated because of its almost undetectable flavor. The rose-colored fruit is ripe when it pops open, revealing three shiny black seeds and a pale chestnut-colored flesh. As he talks, the chef washes and chops fresh kale and Swiss chard—stand-ins for callaloo, leafy greens of taro, or dasheen—which will be cooked down into a buttery, tender side dish similar to collards. “Jamaican food is a blend of many cultures, and many flavors—spicy, sweet, sour, savory, bitter,” he explains. Allspice, sweet coconut milk, lime, ginger, and hot peppers play roles in almost every meal. On the island, rice and peas are actually made with kidney beans or other legumes, following the Caribbean and Central American tradition of beans and rice. Jamaicans give their version a tropical flavor with the addition of coconut milk, which Genet pours in with the beans, followed by the rice. The dish then simmers for an hour so that the fragrant nectar plumps the rice and infuses the legumes. “Rice takes longer to cook with the milk since it’s very rich,” the chef notes, as he adds chopped scallions to the pot. Meanwhile, the hostess moves on to pull a gingerbread cake out of the oven. Though this isn’t a traditional dessert, the use of ginger, a dominant spice in the country’s cuisine, will allow the treat to fit right in with the other eclectic flavors. While he has set the meal in motion, Kenton knows Genet can take the lead after giving his approval to the ginger-lime chicken she prepared. He bids the ladies farewell, allowing them a few moments to reminisce before the other guests arrive. Neighbors Jack and Mary Anderson make their entrance and settle in for cocktails on the veranda. Gazing over Haw Creek Valley from the terrace, they taste the savory combination of fried plantains with ackee and saltfish, as well as the plain fried slices. As the small group is called into the lively dining room painted in purple and gold and decorated with Venetian masks, Genet pulls the roasted chicken topped with caramelized pineapple rings out of the oven. Red Stripe Jamaican beer and wine are poured into ruby-tinted glasses as the hostess brings out the plated meal. Everyone enjoys several helpings of the salty-sweet rice and peas, before the gingerbread cake topped with fresh mango finishes the meal with a touch of sugar and spice. “I’m not familiar with Jamaican cuisine, but if this is any indication, I’ll try it again,” says Mary. A visit to the studio upstairs follows, allowing friends a private viewing of the Asheville scenes the hostess has painted, reaffirming that the artist has found a fresh inspiration in the mountains—blending her old life with the new.